With last week’s Twitter Poll, we thought we’d ask how “into” indie gaming you are. Of course, there’s probably a certain level of bias in an indie game asking about that, but it’s interesting to us! Both categories can do some great things, but there’s usually a pretty distinct difference between the two. We also included a “Both” category, but for the sake of discussion we’re going to just accept that “more video games” always wins. 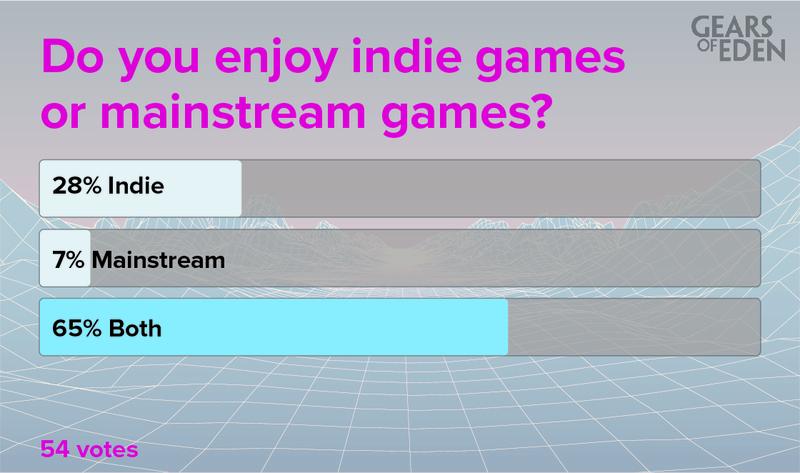 Now, I brought up that inevitable bias for a reason: Indie Game won the race, 28% to 7%. Again, that makes sense: we even tagged #IndieDev! I think though, given the the amount of separation between the two, it’s worth thinking about. What is it about an indie game that’s so exciting to start playing? Very rarely do they have the sheer production value of a mainstream/AAA game, and most major game releases are a pretty safe bet. For instance: I’m not a huge fan of Skyrim. I’m even disappointed by Fallout 4, but you know what? Both of those games can provide some very real fun. And best of all: mainstream games all seem to work pretty well. It’s actually newsworthy if one doesn’t work well, and the developer ends up working hard to bring themselves back into the good graces of fans. Indie games? Not so much. I’ve been playing an indie game that is essentially broken for me, but the developer is still golden in my eyes. I’ll just wait until it’s patched, right? Because with indie games, we see a higher failure rate, but the accomplishments aren’t just successes; they’re triumphs. Stardew Valley transcends nostalgia, Kerbal Space Program is one of the best space sims out there, and Minecraft did no less than create a popular genre of game. In the past few years, some of my favorite gaming experiences have come from games that you can tell were willing to fail. Maybe the writer of an indie game is a little extra into indie games though. That’s it for this week’s Fan Feedback, but we have another poll for you this week. Again, we know we have a biased audience, but we are asking about entertainment mediums. Do you spend more time on TV/Movies, Books, or video games? Narrative is very important to us at GoE, and we find inspiration in many different forms. Be sure to vote above and let us know what you consume most! If you want to be up to date on all things Gears of Eden, be sure to follow us on Twitter and Facebook! Thanks for reading, thanks for voting, and I hope to see you next week!